THIS IS A BOOK ABOUT ICE AND PEOPLE — the role ice has played in the development of Earth’s landscape, climate, and human civilization, and the reciprocal impact of people on the planet’s ice. 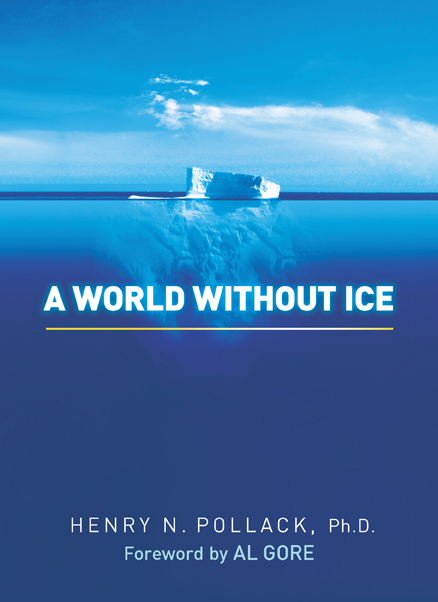 Geophysicist Henry Pollack paints a compelling portrait of the delicate geological balance between ice and climate, and why its rapid disappearance portends serious consequences in our not-so-distant future. Whether sculpting mountains, regulating temperature, influencing ocean currents or defining the limits of human settlement, ice has shaped — and continues to shape — the world we live in. 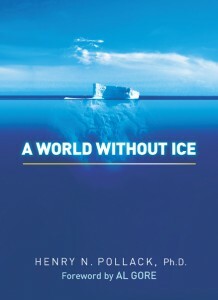 In engaging prose, A World Without Ice offers lucid insight into why ice matters, and how we humans are dramatically changing this critical component of our global environment. During the past three centuries, rapid population growth and the rise of industrial economies have pushed the relationship between ice and people to a tipping point. Soon, for the first time in human history, we may live on a planet without ice. A World Without Ice answers many questions about this pending crisis, and lays out steps we must take to avoid serious impacts on the planet we call home. Henry Pollack has been a professor of geophysics at the University of Michigan for more than forty years, and is one of the world’s leading experts on the temperature of the Earth. He shared the 2007 Nobel Peace Prize with fellow members of the Intergovernmental Panel on Climate Change (IPCC) and former vice president Al Gore. He currently serves as a science advisor to Al Gore’s Climate Project training programs in the U.S. and abroad. He lives in Ann Arbor, Michigan. Tuesday, November 24th: Get Energy Smart! NOW!! !